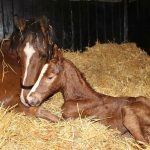 Proud first time Mum Quick March delivered a lovely bay filly by Zoffany on Tuesday night. Both Mum & baby are doing well. Mum visits Havana Gold this season. It’s a girl for Stone Roses!